The fire broke out in a high-rise building of Biswas Builders near New Market area in the capital on Friday night was doused after hectic efforts of hours, reports our correspondent. 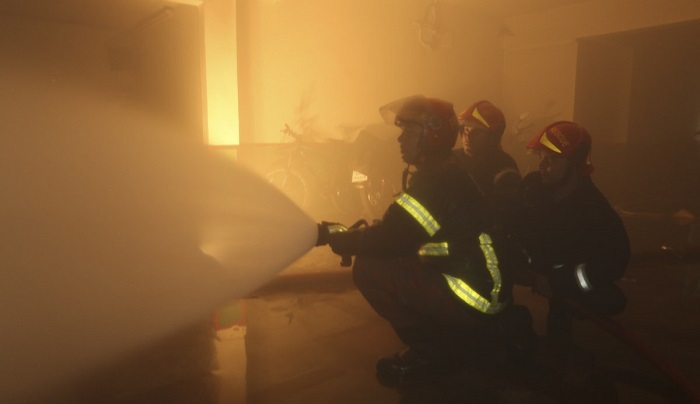 According to the correspondent, the fire ensued at 2nd and 3rd floor of a 17-storey building around 10:50pm, said Md. Azad, an operator at the Fire Service and Civil Defense control room. On information, seven firefighting units rushed to spot and doused the fire around 11:58 pm, he said. However, no casualty was reported, he said adding that the reason behind the fire could not be ascertained immediately. The building has been housed commercial shops and godown as well as residences. Shops, warehouses were housed up to fifth floor of the building and rests of the floors were resided with dozens of families.